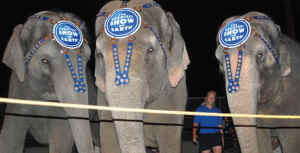 On May 19, 2014, Ketchum City Council in Idaho voted unanimously to ban the use of wild animals in circuses in their community. Local ADI supporter and facilitator for the students, Maya Burrell, shared ADI’s evidence showing the inherent suffering and public safety issues surrounding the use of wild animals in traveling circuses, as well as the science, economics, and abuse to which the animals are subjected during training and handling. Ms. Burrell and students Harrison Blamires, Devon Brown, Evathea Drougas, Kayla Chaffey, Willa Laski, Sam Laski, and Will Griffith attended the council meeting at which the ban was passed as a show of support and to encourage Councilmembers to pass the ordinance ahead of the vote. ADI applauds the City Council for taking a stand on this issue.